I first met David Day in the central branch of the Toronto Reference Library on Yonge Street in the spring of 2009. 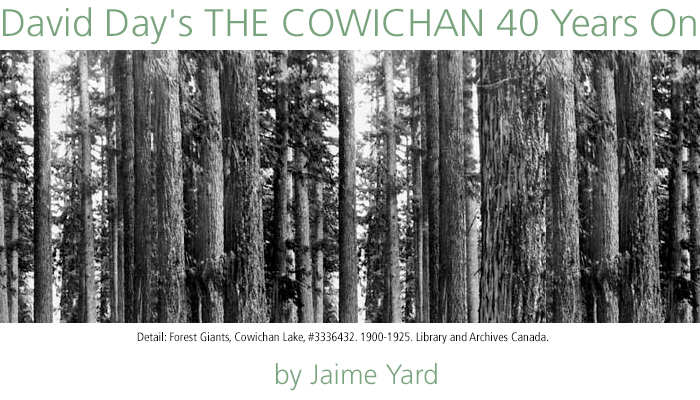 A year earlier I had read his 1975 collection The Cowichan in a flurry of research on logger poets and oral traditions in logging camps. My daughter, then seven-months-old, accompanied me to the interview. She babbled, crawled and breastfed through my floundering attempt to combine finishing my dissertation and parenting. David alternately smiled and laughed at her antics and provided thoughtful reflections upon the questions I asked about logging and the choice that he made to break from early literary representations of the hard living, hard working, man’s man world of logging life in favour of presenting scenes of masculine crisis and carnage in the woods. His devastating vignettes open up a space for dialogue between the big story of the rise of the clear-cut in British Columbia and the many small stories of the melancholic, broken and resilient logger that came when the work stopped for a moment for a meal or a rest.